CPRE Northants FoodMiles Poster Competition judged a success! Learning-Difference is supporting the new DARE2 EU-wide project funded by the Leonardo Transfer of Innovation fund. Learning-DIfference will create a new disability awareness training package for partners in the project aimed at small to medium enterprises in the EU. This will be tested in Poland and Cyprus. Additionally, Learning-Difference will support the implementation of DARE1 disability awareness training package in Iceland for universities. The second PDA national conference on adults with dyslexia in Poland was held in Gdansk University, 28 November 2009. Learning-Difference wrote a keynote paper and a chapter for the conference publication on what happens to UK dyslexic graduate students when they leave university. The conference and publication are part of the the PDAs effort to increase knowledge and understanding in Poland about dyslexia in adulthood. This includes learning about the adult dyslexia situation in other countries. Learning-Difference was one of the guest speakers at a recent international conference on disability awareness for employers. Held in Krakow, Poland at the end of October, there were 200 guests and speakers from the USA and Europe. The conference also heard about the work of the DARE project. The Dyslexia Association Birmingham (DAB) working with Learning-Difference has secured a grant from the Roughley Trust to support their work in the city. News is eagerly awaited on other grant bids that have been submitted. A new Northamptonshire CPRE awareness project to support local food growers and suppliers has started. Learning-Difference helped secure funding and with the project planning. Awareness materials were created by learning-Difference to support the project. A project survey is now underway to assess the market. To see the leaflet and poster click this link. Learning-Difference is working with Dyslexia Association Birmingham (DAB) to raise funds for this key service provider. Funds raised will help DAB to consolidate its already successful services and to develop these services further. Especially important is the advice and support DAB provide free to people affected by Dyslexia in Birmingham and surrounding areas. More details later. Learning-Difference presented information about the DARE Project to over 40 participants representing many EU dyslexia/disability organisations and universities. 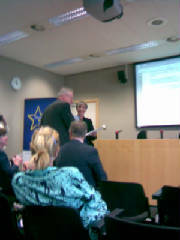 The presentation was part of the DysLearning (Adults) seminar in Antwerp and Brussels in May. The DARE Conference in October 2009 was of particular interest to participants. Click on this link for more information about DARE and the DARE Conference. Learning-Difference attended a seminar in Antwerp in May led by the DysLearning (Adults) partnership. The event included a presentation to MEPs in EU Parliament in Brussels calling for greater support for adults with dyslexia. MEPs said they would do all they could to support the call. The seminar also enabled partners to develop new project proposals around dyslexia across the EU. Four projects are likely to be developed with funding applications to Grundtvig and Leonardo. Learning-Difference hopes to be in one project and made valuable new contacts across EU. The local Dyslexia Association in Northamptonshire has been awarded a Community Foundation Grassroots Grant to maintain its office space, to review its strategy and to develop its marketing. Learning-Difference drafted the bid and will facilitate the strategic review. The award is nearly £5,000. Learning-Difference successfully supported Northampton Town Football in the Community to win a three-year grant from the Football League Trust. The grant is worth £60,000 spread over three years. Learning-Difference wrote the bid for the project totalling nearly £139,000. Called "Kick-Off!" the project is funded under the Trust's "Every Player Counts" initiative. The project aims to make and sustain Northamptonshire as one of the best disability equality football places in the country. Learning-Difference will support the project with project evaluations each year starting in 2010. CPRE Northamptonshire undertook a Learning-Difference Ltd Grant Fundraising training workshop to help them build their capacity to raise funds themselves by training a number of volunteers in grant fundraising. The workshop covered all apsects of grants funding including planning, funding research and bid writing and how to achieve a good relationship with grant givers. Follow-up advice and training is available once they have put their new skills to the test! New post16years disability training package evaluations in Sofia and Krakow by Learning-Difference were successfully conducted in March 2009. The package will be aimed at employer and learning provider organisations in the EU. The evaluations looked at all aspects of the package and the experience of the learners. See DARE page on this website for further details. CPRE FoodMiles Poster Competition judged a success! Learning-Difference worked with CPRE Northamptonshire on its FoodMiles project last year. Part of the project involved all schools in the county entering a poster competition. Dozens of entries from the county's primary schools that took part showed many creative ideas. They clearly demonstrated that the message was getting through to children and families. Pictured here are, left to right: Bernard Quinn, Director Learning-Difference, Sue Baylis, Events Co-ordinator CPRE, and Sir Paul Hayter, Chair CPRE Northamptonshire. Learning-Difference is a partner in DARE - an EU funded project to raise disability awareness in higher education The project will host an international conference in Krakow in October this year. Prestiguous guest speakers will be presenting at the conference which will be held in Europe's second oldest university. The conference will be of interest to anyone working in higher education and disability support for learners. For further information visit the DARE page in this website where you will find a link to the project web site. Picture shows an awareness training session during the testing of the materials being devised by the project consortium. Learning-Difference is training St John Ambulance training teams in dyslexia awareness and communication. Teams from Leicestershire, East Midlands and Nottinghamshire have so far been on the course. They will be followed by their peers in Northamptonshire and Oxfordshire in the coming months. Responses have been very positive to the course: "Definitely helped me to understand about my own actions" "Very useful handouts and interesting course. Thank you!". Learning-Difference has been working with Northampton Town Football In The Community on the successful project N'TRAIN (Say No To Racism In Northamptonshire).The project was recently evaluated and has been included for consideration by the English Football League for an award for its contribution to anti-racism in football and the way it engaged the local community. See our News Archive pages for more information on the project. Learning-Difference has been working with Staffordshire Youth Services to launch our new Understanding Autistic Spectrum Disorder (ASD) awareness course.Teams from discreet outreach projects and youth workers and related professionals from across the county have been attending the new courses in December 2008 and January 2009. The response has been positive: "I feel more confident in working with young people with ASD and how to support them" "My understanding of challenging behaviour is now far greater" "This course will enable me to develop strategies to deal with young people on varying levels of ASD". This new course follows the popular dyslexia and dyspraxia awareness courses run for the county youth service last year - see our News Archive page for more information. Visit our news and information archive for more stories by clicking here.